This is a powerful double insulated sheep shear designed for the farmer. 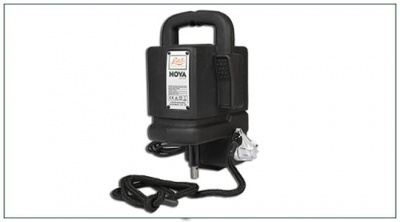 It has a 1.8 meter flexible drive and has the standard Lister rope-pull on/off switch. It can be run from the mains or from a generator due to its low ampage starting current. There is also a 12 volt version that can be run from a 12 volt car battery or leisure battery - please call us about the 12 volt version. The Nova only has one speed (unlike the Nexus which has 2 speeds) and is not available with a solid drive. We Say: This is a great shearing machine. If you are limited by budget and can't stretch to the Nexus, this is a great option. It makes shearing easy, and most don't require the different speed options.